Want A Free Seat At The Arnold Classic Bodybuilding and Bikini Show? incredible fortress of muscle and power…really a sight to see. 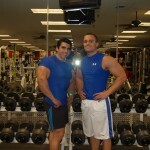 they are not only great bodybuilders but super nice guys as well! that took advantage of it and have seen the benefits. back in December, I can still do something special. “Body Re-Engineering” (valued at $39.99). half a year worth of muscle building and fat blasting workouts! most explosive gains imaginable! (valued at over $250). and put you on the fast track to muscle growth! had a growth spurt… you would be insane not to give this a shot! your gifts IMMEDIATELY (within 24 hours). Enjoy the live bodybuilding.com show!